Since 2010, One World Play Project has teamed up with individuals, organizations and companies to put over two million unpoppable One World Futbols into play across 185 countries. We estimate that more than 60 million youth have experienced the joy that comes from play thanks to the generosity of our outstanding partners. But there’s still work to do. That’s why we were so excited to learn that Coca-Cola and Walmart International wanted to partner with us in more than 10 countries (see list below) to distribute 100,000 One World Futbols to youth in need! This massive collaborative effort is part of the #PassTheHappiness campaign taking place in the months surrounding the 2018 FIFA World Cup™. So while the world’s attention is on football, with the support of celebrities like multi-platinum recording artist Jason DeRulo, we’re taking this opportunity to shine a light on the global need for play and celebrate soccer as a force for social good. 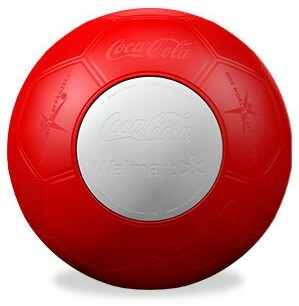 Over the next few months you’ll be able to visit your local Walmart affiliate store and engage online in participating countries where your purchase of select Coca-Cola products will support the distribution of custom One World Futbols to partner organizations like Grassroot Soccer, Street Games and ChildFund International, to name just a few, who are working with underprivileged youth. The list of participating countries include the UK, Argentina, Canada, Central America (Costa Rica, El Salvador, Guatemala, Honduras and Nicaragua), Chile, China, Japan, Mexico and South Africa. Join us as we celebrate passing the happiness to 2.5 million more kids!